The Supplement is a major resource for data on our nation's social insurance and welfare programs. 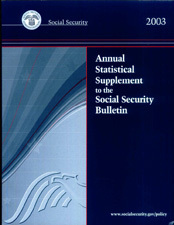 The majority of the statistical tables present information about programs administered by the Social Security Administration—the Old-Age, Survivors, and Disability Insurance programs, known collectively as Social Security, and the Supplemental Security Income program. In addition, data are presented on the major health care programs—Medicare and Medicaid—and income maintenance programs, including Workers' Compensation, Unemployment Insurance, Temporary Disability Insurance, Black Lung benefits, veterans' benefits, Food Stamps, Temporary Assistance for Needy Families, and Low-Income Home Energy Assistance. The Supplement also includes program summaries and legislative histories that help users of the data understand these programs.